Meet Natalie Johnson! The shy girl from Meadow's Creek? The girl whose dreams are made of serious paranormal-sauce? I give up! 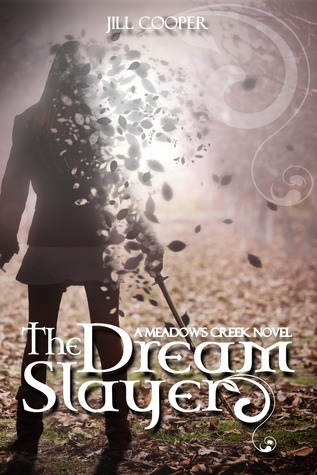 Natalie Johnson is the star character of The Dream Slayer, a YA paranormal novel recently released by Jill Cooper! Get to know her fears and fancies in this short interview. Hi Natalie! It’s so great to have you here on Lovey Dovey Books. Can you tell us a little about yourself? Come on, don’t be shy! Hey there! Oh look, people are going to read what I say? Excuse me while wince. No seriously, I didn’t sign up for this sort of attention when I created a dream alternate dimension, by mistake, whoops! Well, as you can see I am sort of mild mannered. I’m chunky, wear glasses, and most kids at school ignore me like I don’t exist. Which is better than the other kids at school who do nothing but torture me from the moment I step on the bus. So I guess that’s when my dreams started taking a life of their own, and who doesn’t love a little adventure and romance in their dreams? Who was I to know they’d take on a life of their own? What’s your dream self like? Wow, she’s just everything to me, really. It’s not that just she’s beautiful, because she is. But it’s all the other stuff that comes with being her. She’s confident, strong, funny. She can quip with the best of them. She really knows how to stand up for herself and those she cares about. Who wouldn’t want to be like that? Just don’t tell her, okay? Because she doesn’t know she’s not real. How have your dreams been lately? My dreams are getting more lucid. I can force them pretty much anytime I want and sometimes just when I close my eyes I can slip away for a few minutes at a time. We’re gearing up for summer so the Slayer is ready for some summer camp fun, but she has a side mission she needs to take care of first. And I hear there may be some new guy vying for her affection? Do you have a favorite dream? One that you’d like to fall asleep to night after night? The ones where the Slayer is being romanced by Damien. Hellooo handsome! Did I just say that? *Blush* But really, who doesn’t want to be swept off their feet by a dark stranger who is romantic and yummy looking? Do you ever feel like your ability to dream alternate dimensions is a burden, or a gift? Sometimes it’s like a gift because the dreams I have will clue me into something that’s going on in town. I know that if someone in the dream dimension is a doctor, that what their heart’s ultimate wish is for. So it’s great insight into my friends and my enemies minds. But the burden part, if something bad happens to you there, it just MIGHT happen to you here too? Yeah, that’s a huge burden and one that’s all my fault. But not something I could ever have planned for. So it’s just something I have to carry with me. And learn to live with. Guilt ain’t fun. How does it feel to be destined for a life of fighting evil? Can’t we just eat cookies instead of talking about this? You know, it feels kinda stressful. There, I said it. Evil is much more fun in dreams than it is in real life. In my dreams I wake up clean, but in real life, I finishing fighting stuff and then I end up covered in dirt. My parents are starting to think…well, who knows what they think really. But I’m running out of ‘I fell down’ excuses that they’ll believe. Is there anything you would like to say to everyone who will read your story? Just, thanks so much for reading my journey and my story. I hope you like it and will stick around to get to know me and my friends better. I know in the future we’re going to have some really crazy adventures that are going to keep you guessing! It’s going to be a bumpy ride! Thanks for coming out of your shell to speak with us Natalie! If you missed it, here's where you can read my interview with Jill Cooper, author of The Dream Slayer and my review! :) I'm so proud of her! !